To Cite: Manafi Rasi A, Amuzade Amrani F, Rostami Abousaidi S, Aghaalikhani M. The Midterm Results of Revision Total Hip Arthroplasty in Cases with Acetabular Defects: A Single-Center Case Series, J Orthop Spine Trauma. 2018 ; 4(1):e69876. doi: 10.5812/jost.69876. Background: Revision total hip arthroplasty (RTHA) is one of the critical topics in the orthopedic surgery. In this single center case series, the revision treatment of cases with acetabular defects following total hip arthroplasty is reported. Methods: A total of 25 patients with acetabular defects were enrolled in this case series held in Imam Hossein Hospital, Tehran, Iran. The mean follow-up of patients was three years (24 - 42 months). The illustrated data include a history of surgeries, underlying diseases, acetabular defect classification, surgery procedure, and pre- and post-surgery complications and managements, Harris hip score (HHS), leg length discrepancy (LLD). Results: The mean age of patients was 63.8 ± 10.45 years. A total of 14 patients had two previous surgeries, eight patients had three surgeries, and three patients had four previous surgeries. Classification of bone loss using AAOS showed that four patients had grade III and 21 patients had grade IV acetabular bone loss. The RTHA was done using anti-protrusio in 12 patients and large cups in 13 patients. The mean Harris hip score was 22.16 before RTHA, which was 80.6 after revision surgery. Before the operation, the mean leg length discrepancy was 38.84 mm, which was corrected after surgery to an average of 3.56 mm. Conclusions: Extensive evaluation of patients with acetabular defects before and during revision surgery leads to promising results. Larger studies evaluating the management strategy in patients with acetabular defects are needed. Total hip arthroplasty (THA) is the most common reconstructive hip surgery in adults (1). Approximately, 1.2 million THAs are performed in the world each year (2). Ten years survival rate of primary THA has reported as 90% (3). The increase in the number of THAs has resulted in increasing in complications. The most common complications are including loosening the acetabular components and the associated periprosthetic bone loss (4, 5). Moreover, the prosthesis may cross the Kohler line or pelvic discontinuity maybe seen (6). In these patients, large medial defects, with or without spread posterior column defects, has been detected. One of the major causes of acetabular defects is technical mistakes during first operation. These mistakes include over reaming of columns, over reaming of medial wall, and/or fracture of wall or columns (7). Revision total hip arthroplasty (RTHA) in patients with acetabular defects is one of the most challenging types of revision due to wide-spread defects (7). The main goal to manage severe periacetabular bone loss is providing a stable continuousness between ischium and ileum with anatomical hip center reconstruction. The reconstruction in RTHA surgery is done by utilizing porous cups, acetabular reinforcement rings/cages (Ganz Ring and Burch-Schneider Cages also known as anti-protrusio cage) with or without utilizing of cement or bone grafts (8-13). In the report by Kim et al., 35 RTHA using acetabular ring and allogenic bone grafting were followed-up for an average of 3.8 years. The Harris hip score (HHS) was improved to the average of 86 in evaluated cases from 47 prior RTHA surgery (11). Kosashvili et al. reported 44.6 months (24 to 68) mean follow-up of 26 patients who had undergone acetabular revision by component-cage technique. There was no clinical or radiological loosening evidence in 23 hips (88.5%). After 2 years follow-up, the average HHS was improved significantly from 46.6 to 76.6. The reported complications in this report are including one infection, one partial peroneal nerve palsy, and two dislocations (14). In general, the RTHA may lead to endopelvic complications including injury to urologic, vascular, digestive, and neurologic structures (4). In this single center case series, our experience with the revision surgery using anti-protrusio cage and large cup in 25 cases with severe acetabular bone loss (21 cases type IV and 4 cases type III, AAOS classification) is reported. This primary report could be a basis for further larger studies and figuring out a general revision approach for management of patients with acetabular defects. This study was conducted in accordance with deceleration of Helsinki and approved by the Ethic Committee of Shahid Beheshti University of Medical Sciences, Tehran, Iran. 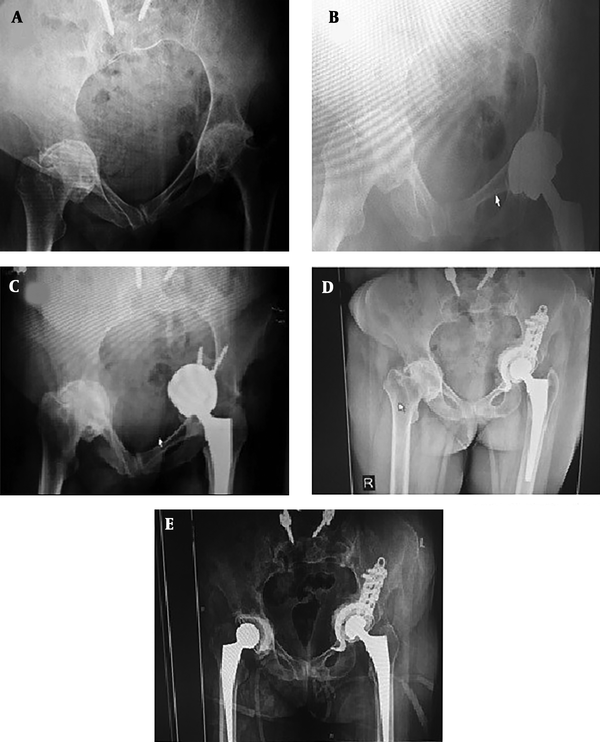 In this single center case series, the patients with acetabular defects who had undergone revision surgery using cage or large cup in Department of Orthopedics, Imam Hossein Hospital, Tehran, Iran between 2011 to 2017, were enrolled. The inclusion criteria included acetabular defects following THA surgery. The exclusion criteria included any history of cancer and chemotherapy. According to the occurrence of multiple pelvic surgeries on these patients, comprehensive evaluations including lab exams and controlling underlying diseases, were necessary before accomplishing any new surgery. Plain X-rays have been captured from five pelvic views including pelvic antero-posterior, inlet and outlet images, judet view graphs e.g. oblique obturator, and oblique iliac. The other X-rays were including lumbosacral, antero-posterior, and lateral hip and knee graphs of the affected side. Pelvic CT-Scan was taken in all patients with axial, coronal and sagittal cuts, and three-dimensional reconstruction. All imaging helped to evaluate the hip bone defects and concurrent pathologies. The type and size of defects were classified using AAOS systems (Table 1). The hip clinical and functional status was evaluated by using the Harris hip score (HHS) questionnaire. Presence of infection was evaluated preoperatively in all patients using the results of clinical and laboratory examinations. If the infection was detected before surgery, the patient was operated in two-stage. For the cases who were suspicious for infection, frozen sections were taken during surgery and had been evaluated for the number of PMNs in high-power field microscopy. More than 10 PMNs in each high-power field of frozen sections were considered as infection and the patients underwent two-stage surgery. In two-stage surgery, all the previous devices were removed and replaced by antibiotic-coated spacer and the patient treated with intravenous antibiotics for six to 12 weeks. If after the antibiotic treatment the patient still had clinical and laboratory signs of infection or more than 10 PMNs in HPF of frozen sections, debridement and washing had been done, new antibiotic-coated spacer had been implanted, and the patient was treated with intravenous antibiotics for another six to 12 weeks. When the infection was revealed the patient underwent the revision surgery. The options for RTHA in patients with acetabular defects are including cemented acetabular component, cup cage, acetabular cage (anti-protrusio cage), acetabular reconstruction with bone graft (structural allograft), jumbo cup, and custom triflange implants. In this study, the patients more than 60 years old or large defects of posterior and anterior columns with no support for cementless cups underwent the revision using anti-protrusio cage and linear cement. This decision in old patients was made due to high prevalence of osteoporosis and the weakness of acetabulum to support the more common cups. On the other hand, in the patients with medial defects and posterior and anterior columns that supported cementless cups, big size cementless cup had been used for revision. The patients with infection underwent total revision and other patients underwent cup revision alone. All surgeries had been done with one pelvic surgeon. The Harding surgery approach had been used in all patients. Drain was placed for all patients. The Harris hip score (HHS) and leg length discrepancy (LLD) was measured for all patients after surgery and after follow-up period. The drains were removed in the second day after surgery. The sutures were removed after three weeks. All patients had also been evaluated regarding infection and vascular complications. The weight bearing had started three days after surgery by toe touch weight bearing and then progressed to partial weight bearing after six to eight weeks. Full weight bearing had been initiated after 12th week. Data are presented as mean ± standard deviation and/or percentage (number). Paired t-test was used for comparing the means before and after RTHA. In this study, 25 patients with acetabular defects with indication of RTHA were enrolled. The mean follow-up of enrolled patients was three years (24 - 42 months). Demographic and pre-operative information of patients are summarized in Table 2. The mean age of patients was 63.8 ± 10.45 years. A total of 15 cases were male, and 10 cases were female. Evaluating the underlying disorders revealed that 10 patients had rheumatologic disorders (seven cases with rheumatic arthritis and three cases with ankylosing spondylitis), two patients had femoral head AVN, 11 patients had osteoarthritis, and two patients had osteoarthritis with history of trauma. All patients had osteolysis, bone loss, and cup migration before revision surgery. A total of 14 patients had a history of two previous pelvic surgeries, eight patients had three previous surgeries, and three patients had a history of four surgeries. Six patients (24%) had been diagnosed with an infection in the prosthesis area, which were managed by two-stage revision surgery, as explained in Methods section. One of these six cases had an uncontrollable infection where all previous devices were removed, and the patient was managed with recurrent incision and drainage combined with intravenous antibiotic therapy. Based on AAOS classification of acetabular bone loss, four patients were categorized as type III (combined deficiency) and 21 cases were categorized as type IV (pelvic discontinuity). The revision surgery in 12 patients had been done using anti-protrusio cage and large cup had been utilized in 13 patients. aData are presented as mean ± standard deviation and/or percentage (number). There was no vascular complication in evaluated patients. No nerve injury had occurred during revision surgeries. Two cases had dislocation after revision surgery, one had openly relocated (femoral component malposition led to dislocation) and the other had closely relocated. There was serious discharge from incisions in three patients, which was revealed up to day 14 after revision surgery. One case had been diagnosed with deep vein thrombosis that had managed by standard protocol. A total of 13 patients were walking with one assistive cane and 12 patients were walking with two assistive cane. Three cases had permanently taken analgesics and 8 cases had taken analgesics temporarily. HHS and LLD scores were calculated for all enrolled cases. Mean HHS score before revision surgery was 22.16 ± 7.15, which significantly increased to 80.6 ± 15.8 after revision surgery (P < 0.05). Moreover, the LLD score was 38.84 ± 9.28 before revision surgery and 3.56 ± 2.56 after RTHA (P < 0.05). The imaging of a patient in this series are reported in Figure 1 as an example. Figure 1. A, a 48-year-old woman with a history of rheumatic arthritis and acetabular protrusion; B, the patients had undergone primary total hip arthroplasty; C, following weight bearing cup, protrusion had occurred; D, therefore, the patient underwent RTHA with anti-protrusio cage and the results are shown after two years; E, after four years, the contralateral hip underwent THA. In this single center case series, we report 25 patients of RTHA following acetabular defects after primary THA. Four patients had type III (combined deficiency) and 21 cases had type IV (pelvic discontinuity) acetabular bone loss assessed by AAOS classification. The RTHA surgeries were accomplished utilizing anti-protrusio cage and large cups. Both HHS and LLD indices were improved after revision surgeries. The cases with infection were managed in two-stages by implanting antibiotic-coated spacer and intravenous antibiotics followed by revision surgery. The complications after revision surgeries were few as explained in the results. We used anti-protrusio cages in patients (12 cases) with older age and large defects with no proper support for cementless cups. The anti-protrusio cage (Burch-Schneider Cage) was first designed in 1974 and then modified in 1975 (15, 16). The anti-protrusio cage is useful for treatment of severe acetabular rim and cranio-lateral border of the acetabulum bone defects and also in older patients owing to less acetabular support following osteoporosis. Moreover, with use of anti-protrusio cage, larger areas of acetabular loss could be bridged (17). There are several reports indicating the short- and long-term results of using the anti-protrusio cages in RTHA (15, 18-23). Regis et al. reported the total survival rate of 87.5% in a mean follow-up of 11.7 years using anti-protrusio cage and bulk allograft revision surgery of patients with extensive acetabular bone loss after primary THA (24). Moreover, Muller et al. indicated that 76% and 79% of the implants had survived after five and 8.5 years, respectively (16, 23). HHS and LLD are two assessing scores for successfulness of THA and/or RTHA. Although, the HHS score was low in enrolled cases with acetabular defects in our study, it was significantly improved after revision surgery. In addition, in patients with superior migration of cup, we observed limb length difference. Following the revision surgery and creating the acetabulum in the proper location, the LLD had become the lowest. In the study by Park et al., the long-term outcomes of RTHA using acetabular reinforcement ring with a hook (ARRH) and bone grafting in patients with severe defects of acetabulum is reported. Based on AAOS classification, seven out of 48 cases had type I (segmental deficiency), 3 cases had type II (cavity deficiency), and 38 cases had type III (combined deficiency) acetabular bone deficiency. The results showed that the HHS improved from 52.6 to 82 after RTHA. Moreover, the ARRH survival was 60% after 11.4 years follow-up (25). The major limitations of this study were low number of evaluated cases and short term of follow-up. Moreover, the presented data in this study were from a single center. Thus, further multi-center researches with higher number of cases and longer follow-up periods are recommended. Acetabular defects following total hip arthroplasty are challenging cases to manage. Revision surgeries should be done by complete pre-operative evaluations and individualized management. Anti-protrusio cages are good choices for cases with older age (more chance of osteoporosis), large defects and inappropriate supports. On the other hand, large cementless cups are useful for cases with less bone defects. Our experience by the above approach was promising results with few complications. 1. Petis S, Howard JL, Lanting BL, Vasarhelyi EM. Surgical approach in primary total hip arthroplasty: Anatomy, technique and clinical outcomes. Can J Surg. 2015;58(2):128-39. [PubMed: 25799249]. [PubMed Central: PMC4373995]. 2. Dreinhofer KE, Dieppe P, Sturmer T, Grober-Gratz D, Floren M, Gunther KP, et al. Indications for total hip replacement: Comparison of assessments of orthopaedic surgeons and referring physicians. Ann Rheum Dis. 2006;65(10):1346-50. doi: 10.1136/ard.2005.047811. [PubMed: 16439438]. [PubMed Central: PMC1798326]. 3. Malchau H, Herberts P, Eisler T, Garellick G, Soderman P. The Swedish total hip replacement register. J Bone Joint Surg Am. 2002;84-A Suppl 2:2-20. [PubMed: 12479335]. 4. Kim DH, Cho SH, Jeong ST, Park HB, Hwang SC, Park JS. Restoration of the center of rotation in revision total hip arthroplasty. J Arthroplasty. 2010;25(7):1041-6. doi: 10.1016/j.arth.2009.07.023. [PubMed: 19775853]. 5. Sakai T, Ohzono K, Nishii T, Takao M, Miki H, Nakamura N, et al. Modular acetabular reconstructive cup in acetabular revision total hip arthroplasty at a minimum ten year follow-up. Int Orthop. 2013;37(4):605-10. doi: 10.1007/s00264-013-1818-4. [PubMed: 23423427]. [PubMed Central: PMC3609976]. 6. Paprosky WG, Perona PG, Lawrence JM. Acetabular defect classification and surgical reconstruction in revision arthroplasty. A 6-year follow-up evaluation. J Arthroplasty. 1994;9(1):33-44. [PubMed: 8163974]. 7. Gouin F, Crenn V, Tabutin J, Societe francaise de chirurgie de la hanche et du G. Subperitoneal approach in revision arthroplasty for acetabular component protrusion: Analysis of practices within the French Hip and Knee Society (SFHG). Orthop Traumatol Surg Res. 2017;103(1):27-31. doi: 10.1016/j.otsr.2016.10.005. [PubMed: 27876582]. 8. Dunlop DG, Brewster NT, Madabhushi SP, Usmani AS, Pankaj P, Howie CR. Techniques to improve the shear strength of impacted bone graft: The effect of particle size and washing of the graft. J Bone Joint Surg Am. 2003;85-A(4):639-46. [PubMed: 12672839]. 9. Patil N, Hwang K, Goodman SB. Cancellous impaction bone grafting of acetabular defects in complex primary and revision total hip arthroplasty. Orthopedics. 2012;35(3):e306-12. doi: 10.3928/01477447-20120222-24. [PubMed: 22385438]. 10. Chen XD, Waddell JP, Morton J, Schemitsch EH. Isolated acetabular revision after total hip arthroplasty: Results at 5-9 years of follow-up. Int Orthop. 2005;29(5):277-80. doi: 10.1007/s00264-005-0674-2. [PubMed: 16094540]. [PubMed Central: PMC3456643]. 11. Pulido L, Rachala SR, Cabanela ME. Cementless acetabular revision: Past, present, and future. Revision total hip arthroplasty: The acetabular side using cementless implants. Int Orthop. 2011;35(2):289-98. doi: 10.1007/s00264-010-1198-y. [PubMed: 21234562]. [PubMed Central: PMC3032100]. 12. Berry DJ. Acetabular anti-protrusio rings and cages in revision total hip arthroplasty. Semin Arthroplasty. 1995;6(2):68-75. [PubMed: 10155691]. 13. Gill TJ, Siebenrock K, Oberholzer R, Ganz R. Acetabular reconstruction in developmental dysplasia of the hip. J Arthroplasty. 1999;14(2):131-7. doi: 10.1016/s0883-5403(99)90115-8. 14. Kosashvili Y, Backstein D, Safir O, Lakstein D, Gross AE. Acetabular revision using an anti-protrusion (ilio-ischial) cage and trabecular metal acetabular component for severe acetabular bone loss associated with pelvic discontinuity. J Bone Joint Surg Br. 2009;91(7):870-6. doi: 10.1302/0301-620X.91B7.22181. [PubMed: 19567849]. 15. Bohm P, Banzhaf S. Acetabular revision with allograft bone. 103 revisions with 3 reconstruction alternatives, followed for 0.3-13 years. Acta Orthop Scand. 1999;70(3):240-9. [PubMed: 10429598]. 16. Gill TJ, Sledge JB, Muller ME. The Burch-Schneider anti-protrusio cage in revision total hip arthroplasty: Indications, principles and long-term results. J Bone Joint Surg Br. 1998;80(6):946-53. [PubMed: 9853483]. 17. Ewers A, Spross C, Ebneter L, Kulling F, Giesinger K, Zdravkovic V, et al. 10-year survival of acetabular reinforcement rings/cages for complex hip arthroplasty. Open Orthop J. 2015;9:163-7. doi: 10.2174/1874325001509010163. [PubMed: 26157533]. [PubMed Central: PMC4483540]. 18. Jones L, Grammatopoulos G, Singer G. The Burch-Schneider cage: 9-year survival in paprosky type 3 acetabular defects. Clinical and radiological follow-up. HIP Int. 2012;22(1):28-34. doi: 10.5301/HIP.2012.9078. 19. Gaiani L, Bertelli R, Palmonari M, Vicenzi G. Total hip arthroplasty revision in elderly people with cement and Burch-Schneider anti-protrusio cage. Chir Organi Mov. 2009;93(1):15-9. doi: 10.1007/s12306-009-0019-1. [PubMed: 19711157]. 20. Regis D, Sandri A, Bonetti I, Bortolami O, Bartolozzi P. A minimum of 10-year follow-up of the Burch-Schneider cage and bulk allografts for the revision of pelvic discontinuity. J Arthroplasty. 2012;27(6):1057-63 e1. doi: 10.1016/j.arth.2011.11.019. [PubMed: 22397857]. 21. Wachtl SW, Jung M, Jakob RP, Gautier E. The Burch-Schneider antiprotrusio cage in acetabular revision surgery: A mean follow-up of 12 years. J Arthroplasty. 2000;15(8):959-63. [PubMed: 11112187]. 22. Riesgo AM, Hochfelder JP, Adler EM, Slover JD, Specht LM, Iorio R. Survivorship and complications of revision total hip arthroplasty with a mid-modular femoral stem. J Arthroplasty. 2015;30(12):2260-3. doi: 10.1016/j.arth.2015.06.037. [PubMed: 26220105]. 23. Berry DJ, Muller ME. Revision arthroplasty using an anti-protrusio cage for massive acetabular bone deficiency. J Bone Joint Surg Br. 1992;74(5):711-5. [PubMed: 1527119]. 24. Regis D, Magnan B, Sandri A, Bartolozzi P. Long-term results of anti-protrusion cage and massive allografts for the management of periprosthetic acetabular bone loss. J Arthroplasty. 2008;23(6):826-32. doi: 10.1016/j.arth.2007.06.017. [PubMed: 18534526]. 25. Park KS, Seon JK, Lee KB, Kim SK, Chan CK, Yoon TR. Revision total hip arthroplasty using an acetabular reinforcement ring with a hook: A precise follow-up, at average 11.4 years, of a previous report. J Arthroplasty. 2017;32(2):503-9. doi: 10.1016/j.arth.2016.07.010. [PubMed: 27546473].